Streetscapes and public rights-of-way are valuable real estate, although people often forget they are not just about moving motor vehicles. They are also the front doors to homes, schools and businesses. As Montgomery County urbanizes and its spaces become more constrained, planners are re-considering how to create more value from our streetscapes. 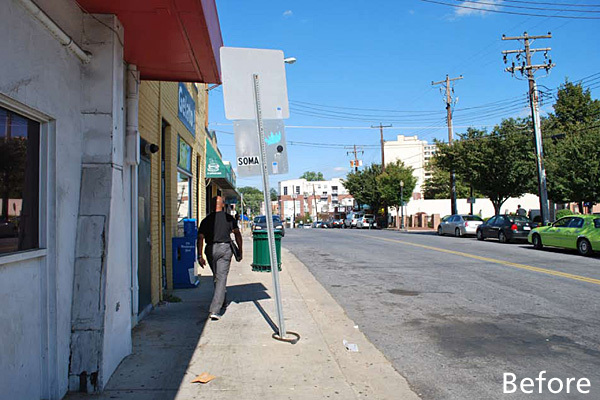 The Planning Department conducted a year-long project on environmental site design (ESD) focused on street edges. ESD integrates site design, natural hydrology, and other controls to capture and treat runoff. In addition to collecting drainage and wastewater, roadsides accommodate utilities, as well as provide space for pedestrians and off-road bicyclists, but trees and natural vegetation have often taken a back seat to other uses. This project has resulted in plans for retrofitting road sections in suburban and urban areas to better handle stormwater and improve the environment for pedestrians and cyclists in addition to motorists. Planners are working with County agencies and the County Council to establish policies to encourage ESD practices along county roads. An example of an improved urban streetscape. 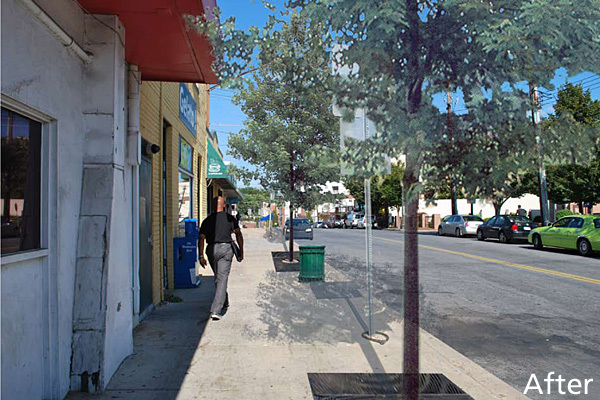 The Planning Department worked with Peg Staeheli, a landscape architect and national leader on designing streets for people and restoring natural systems, on the streetscapes project. Staeheli, ASLA, LEED AP, is president of SvR Design Company, a Seattle-based civil engineering and landscape architecture firm. SvR worked with planners to evaluate two sample street sections [PDF] (pdf, 1.6MB) — Fairland Road in Fairland and Marinelli Road in White Flint. The sections incorporate space requirements for road elements, such as adding hiker/biker paths , installing planting strips and constructing urban planter boxes. Watch a presentation by Peg Staeheli of SvR Design Company at our October 20, 2011 speaker series event. Staeheli showed how to transform public rights-of-way to achieve their full potential and outlined strategies to integrate Complete Streets with improvements in water quality.